Nestled on a lush palm island in the heart of the northern Okavango Delta, intimate Shinde Camp is located on the edge of Shinde lagoon, teeming with animal and birdlife. Shinde Camp’s unique tree house made of a multi-tiered raised dining/lounge area under canvas, set among the shade of ebony and mangosteen, complements the atmosphere of this original safari camp. Shinde Camp offers eight large safari-style tents include modern en-suite bathrooms with hot and cold running water and flush toilet. Comfort and exclusivity can best describe Shinde Camp, as it accommodates only 16 guests in total for an intimate safari experience. Each tent, strategically positioned, offers splendid views, whether across the Delta’s mysterious waterways or open grasslands. 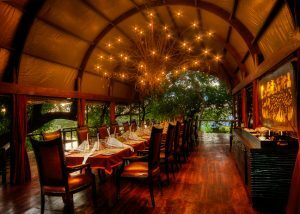 This full-service luxury tented safari camp features fantastic cuisine and dining is a special experience. As part of the Shinde private concession, all game activities are exclusive to guests of Shinde. Guide escorted private game activities include morning, afternoon and evening game drives, game walks, mokoros, motor boats and excellent fishing. Bountiful antelope abound, including the sitatunga which have adapted their hooves to walk on the unstable beds of reeds floating on the water. Abundant wildlife, the waters of the Okavango delta and authentic accommodations combine at Shinde Camp for a wonderful safari experience.